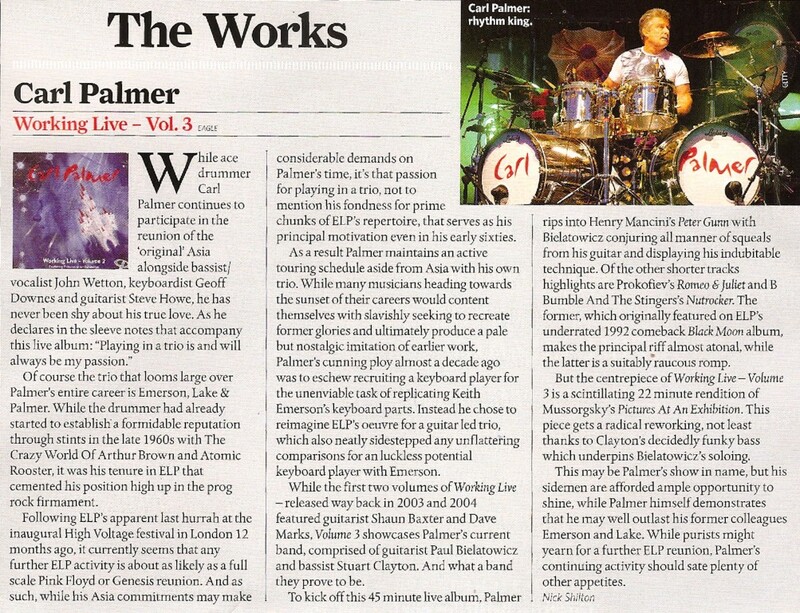 29 July 2011 - Nick Shilton has reviewed Working Live – Volume 3 by the Carl Palmer Band for Classic Rock Magazine. "But the centrepiece of Working Live – Volume 3 is a scintillating 22 minute rendition of Mussorgsky's Pictures At An Exhibition. This piece gets a radical reworking, not least thanks to Clayton's decidedly funky bass which underpins Bielatowicz's soloing. [...] Palmer himself demonstrates that he may well outlast his former colleagues Emerson and Lake."